In an earlier post I discussed Marjorie Kelly’s new book “Owning our Future,” which contrasts “extractive” ownership with “generative” ownership. I want to follow up on that post here, with a focus on Internet access, which I’ve been discussing in a series of recent posts (see here, here, here and here). As for my thoughts on community owned broadband: I’m for it. It’s an important piece of locally controlled ownership, where we can begin to have more control over the necessities of our economy. Much better to own it than to try to regulate it, which is usually thwarted. I agree with her, and in this post I’m going to take an initial stab at applying the analytical framework in Kelly’s book to Internet access. Specifically, I’m going to compare community-owned broadband networks to networks owned by incumbent cablecos and telcos, in particular the large, publicly-traded companies that serve the majority of American homes and businesses. As Kelly notes, while a Living Purpose is necessary and fundamental to a generative design, it is not sufficient to sustain it over time. For that, the organization’s purpose must be supported by one or more other generative structural elements: Membership (who’s part of the enterprise, has a right to a say in profits, and takes the risk of ownership); Governance; Finance and/or Networks. If traditional approaches use Commodity Networks, where goods trade based solely on price, generative economies use Ethical Networks, which offer collective support for social and ecological norms. So let’s see how this framework applies to local broadband Internet access. Having listened to many an earnings call and followed the telecom industry for more than two decades, it seems pretty clear to me that the dominant publicly-traded cable and telephone companies have an overriding Financial Purpose, as expressed by management’s intense focus on cash flow, stock price, profits, market share, average revenue per unit, pricing power, and other financial metrics. Related to these metrics is an intense focus (in statements made to Wall Street analysts as well as actual financial decision-making) on “return of capital to shareholders,” largely in the form of dividends and stock buybacks. While this is perfectly legal and very understandable from the perspective of corporate management (whose compensation is often based on stock price), the fact is that these returns to shareholders are allocations of cash flow that might otherwise be used to deliver more value to customers. For example, this cash flow could be invested in network upgrades and/or improved customer service. The latter is particularly notable, since both the cable and telephone industries have longstanding and well-earned reputations for poor customer service, as reflected in virtually all national surveys (and plenty of anecdotes shared among friends and posted on the web). This, I believe, is largely because, as monopolists or duopolists with substantial market power and extractive ownership designs, these companies tend to be more focused on satisfying the desires of shareholders and Wall Street analysts than those of largely-captive customers with limited options for taking their business elsewhere. These same industry dynamics are also clear evidence that, in addition to Financial Purpose, the nation’s large publicly-traded cable and telecom giants are also characterized by Absentee Ownership, Governance by Markets, Casino Finance and Commodity Networks, and that their managements are heavily influenced by pressure from Wall Street analysts and traders, whose work takes place even more deeply at the core of our economy’s financial extraction machinery. This combination of extractive design and extreme market power is also evidenced by the generally upward trend in pricing and average revenue per customer, even as the cost of providing broadband service—already quite low and generating very high margins–is declining. 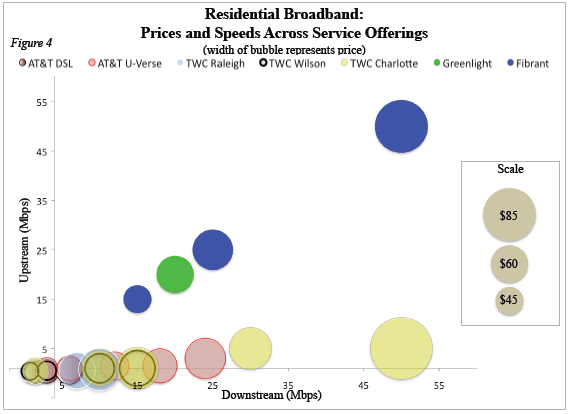 It can also be seen in the following graphic (prepared by the staff of Community Broadband Networks), which shows the download and upload speeds and prices available from the largest publicly-traded broadband providers in North Carolina. The graph is particularly illuminating because it compares these with the speeds and prices available from two of the state’s community-owned fiber networks–which, as discussed below, operate with a very different set of ownership characteristics. As it clearly shows, the community networks’ speeds are much higher, and deliver a lot more bandwidth for the buck than services available from the state’s largest publicly-traded broadband providers. As the graphic suggests, community-owned networks can provide an alternative to the financial extraction model that characterizes publicly-traded providers of broadband service. Rather than maximize financial extraction at the expense of network upgrades, faster speeds, customer service and lower prices, these community-owned networks aim to deliver very high speeds at prices that are affordable yet also enable them to cover their operating and capital costs. And, importantly, these networks tend to deliver much higher upload speeds than “extractive” broadband networks. This makes it easier for end-users to develop and deliver their own content and services, and to exchange value among themselves and with the Internet community as a whole–even if that value is not readily monetized by the network operator. In contrast, “extractive” network operators tend to view end-users as consumers, and to steer their network usage as much as possible toward the content and services that are most readily monetized at the operator’s target levels of profitability. The family of community-owned networks includes several variations, including municipal ownership (often through an existing municipal power utility) and end-user cooperatives (often through an existing rural electric co-op). While there are legal, organizational and financial differences between these ownership models, these aren’t large enough to significantly alter the fundamental nature of our comparison to ownership by publicly-traded cable and telephone companies. That being said, these differences may yield a somewhat different mix of strengths and weaknesses for cooperative, municipal and other community ownership models, including how fully each one reflects Kelly’s generative ownership design elements. Though this post won’t delve very deeply into these differences, they strike me as a worthy topic for further study (and perhaps some future blog posts). In applying Kelly’s framework to a comparison of community and “extractive” ownership models, let’s start with Purpose, which Kelly describes as the most fundamental design element. Having studied a number of community-broadband networks, I’d say that all or most were undertaken with a purpose something like the following: to provide households, businesses and public service organizations (e.g., schools, healthcare providers, public safety, etc.) with affordable, reliable, symmetrical, high-capacity broadband connectivity and related services, to support their ability to prosper and thrive in an increasingly competitive and knowledge-based global economy. It’s also clear to me that compared with most publicly-owned cablecos and telcos, community-owned networks tend to have Rooted Membership (vs. the absentee ownership characterized by publicly-traded stocks), Mission-Controlled Governance (vs. governance by markets, stock prices and related cash flow and profit-maximization metrics), and tend to function as part of local and national Ethical Networks (vs. Commodity Networks geared toward maximizing financial extraction). That being said, the experience of various community-owned networks suggests that the extent to which these generative elements are embedded in an organization’s design, and maintained over time, can vary considerably. For example, in the case of municipally-owned networks, the departure of strong founding project leadership has sometimes led to a migration of decision-making to political leaders lacking appropriate industry expertise, particularly if the network was deployed in a community that lacked an existing public utility organization that was well-managed and enjoyed the loyalty and respect of its local customer base. This strikes me as the case in a management transition experienced several years ago by the municipal fiber network in Burlington, VT. In other cases, management of a municipally-owned network has experienced disruptive discontinuities when local political leadership has changed. This seems to be most likely if such change occurs when the network and/or city is facing financial or other challenges, and/or when the newly elected officials view the network and its previous management as a useful scapegoat for rallying political support. Similarly, the interaction of political dynamics among multiple jurisdictions has sometimes complicated and/or delayed decision-making, which can aggravate situations in which multi-city projects face unexpected financial or operational problems. My sense is that this has been a factor for the multi-city UTOPIA fiber network in Utah, one that was made even more difficult by state restrictions on the network’s ability to provide retail services. In my view, these and other risks related to local political dynamics highlight a generative element favoring cooperative ownership structures, where the network is directly owned by its end-users rather than by a local government with a broad range of sometimes-competing responsibilities and pressures, and typically led by politicians lacking industry expertise or, in some cases, even a reasonable appreciation for the value and managerial requirements of the network. While there seems to be a fairly widespread awareness of the importance of stakeholder “buy-in” for a community network to succeed, my sense is that Kelly’s multi-part framework for analyzing “generative” ownership structures can help community network planners operationalize, strengthen and maintain that buy-in. The value (and often the challenge) of building and maintaining stakeholder buy-in seems especially important during a network’s early years, when the bulk of construction is underway. This is because costs are especially high during this startup phase, while revenues are just beginning to ramp up. My sense is that it’s during this startup period that incumbents have the most leverage to mobilize their considerable resources to weaken both the economic viability and credibility of community networks. As I consider Kelly’s generative design elements, one thing that strikes me is that a municipal network is a resource likely to impact virtually every organization in a community, including local government, public safety, education, healthcare, non-profits, and businesses both large and small. This suggests that important elements of generative structure (e.g., Rooted Membership and Mission-Controlled Governance) will be closely tied to how these various stakeholders (as well as residential users) are involved in decision-making related to network management, build-out plans, resource allocation, service development, pricing, etc. This governance issue also relates to the Ethical Network element of generative ownership, as reflected in the relationships among community leaders, their local constituencies and their counterparts in other communities that are also attempting to build and operate networks with generative ownership designs. Deploying a community broadband network that relies on Stakeholder Finance strikes me as more challenging than some of the other generative design elements, in large part because the high cost and capital-intensive nature of communication networks has typically required access to public debt markets. In a minority of cases, however, the link to Stakeholder Finance is more clear and seems likely to enhance the level and benefits of desirable community buy-in. ECFiber originally intended to secure funding from institutional investors through public markets. This source of funding dried up as a result of the September 2008 financial meltdown. Since then we have been unable to find funding through federal and state stimulus programs or through conventional lenders. In 2009, ECFiber decided to construct its network in increments, financed by the sale of promissory notes sold to individuals in member towns. The notes would be tax-exempt at the state and federal level. Since making that decision, ECFiber has closed on three rounds of locally-generated funding totaling more than $2.2 million and began activating customers in early 2012. While the financing model being pioneered by ECFiber may lead to slower network buildout, it may also enhance a project’s generative ownership design (particularly the Stakeholder Finance element), since its funding will come from community members with a three-pronged interest in its success—as customers, as local community members, and as financial investors. This underscores a broader and important point: community broadband planners are likely to increase their chances for success if, from the beginning, they keep in mind all elements of Kelly’s generative ownership structure, including how they interact with each other to support the project’s Living Purpose. As both successful and unsuccessful community broadband projects have demonstrated, strong and sustained support from community stakeholders provides a solid—and perhaps the most essential– foundation upon which to build a community network. This foundation has proven to be especially important during a project’s startup phase, when learning curves and financial pressures abound, and when community networks are likely to be most vulnerable to well-financed political, legal and predatory pricing attacks by incumbent service providers. It seems to me that, the more fully and firmly that stakeholder support is embedded in a community network’s design, the more likely it is to weather these startup storms and any squalls that might follow in later years. And, importantly, the more likely it will be to serve the community development goals that give it the Living Purpose that so clearly distinguishes it from the financial extraction-based networks currently exploiting their entrenched market (and political) power in most of our nation’s communities. This entry was posted in Communication Policy, Community Broadband, Human Evolution, New Economy Movement and tagged community broadband, generative ownership, Marjorie Kelly. Bookmark the permalink.